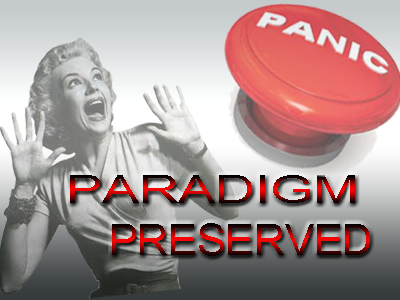 Radio Show Panics, Cancels Truther Appearance- Left-Right Paradigm Preserved! "People are waking up" - That's what many of us believe. Americans everywhere are often talking this way. Government corruption and conspiracies at an all-time high. The information age exploding, running on all cylinders. It's a great time to be awakened to the journey of humanity, isn't it? For anyone awake to the political global schemes of the global elite controllers there is now almost no piece of news that surprises us because everything fits in perfectly with the new world order plans. This is great huh? Actually not so for everyone. There is still a massive segment of humanity particularly in the United States that is just now barely beginning to wake up or are still not awakened. They may show glimpse of possibly waking up to what is happening but something seems to be holding them down from snapping to a full sense of awareness. That something is an important component of the matrix we all live in. That something in America in particular is now very quantifiable. As we slowly approach yet another election year of the same politics that keep the same criminals in charge it is time to confront the very thing that is stifling mass awakening. It's the unavoidable, ever-present, encompassing, persistent, never-ending and perpetual Left versus Right old beaten and played-out American paradigm. It's this paradigm that ensures we remain in a perpetual state of war abroad and division at home. It's the perfect tool for CIA to keep running in the background of everyone's lives to maintain control of the masses and push political pro-war agendas. This rigid, thought-blocking psychological phenomenon known as the American Left-Right paradigm must be destroyed once for all. It is singlehandedly holding back many well intended Americans from becoming aware and enlightened to the reality of the world we live in. For example, back in the middle of March 2015 yours truly was invited to come on 'The Daugherty Report', apparently a nationally syndicated radio program, to discuss my article 'Wheels Fall Off the ISIS Psyop Forcing New Meme: Iran Nukes!' - The show is hosted by Elizabeth Daugherty but the invitation came from a gentleman named Michael. Michael urgently emailed me asking me to come on the show and discuss the article so I thought, great. For anyone following my writings over the years, you know exactly where I'm coming from and where I'm going with the issue of ISIS, anti-Iran propaganda, the new world order, CIA, government pro-war and "war on terror" propaganda. But apparently the people at 'The Daugherty Report' may not have been aware of my position on these topics. After listening to some of Daugherty's previous shows and hearing the kinds of guests she had on her show to discuss the "Iran nukes" issue however, I was beginning to wonder why they would have me on the show ... unless someone at The Daugherty Report (say Elizabeth herself) is beginning to wake up. I thought perhaps Elizabeth is awakened to the new world order plans. She sounds intelligent and she's asking questions, I thought, great! But after having numerous guests on the show, all parroting the same old Left vs Right government cookie-cut paradigm something happened on the day of the show. My appearance on the show March 19 2015 was "rescheduled" at the last minute for recording the next day. Then the following day came (March 20 2015) and their producer has me on the phone and we are about to begin recording for the show. I'm thinking to myself, great opportunity to spread the truth about CIA lies, government propaganda, the new world order plans and the current information war that permeates this very show! Just before we began recording however, it seemed something had gone wrong. It appears that despite the week long urgent open invitation, The Daugherty Report suddenly somehow wasn't sure who I was. Producer Michael, it appeared, had not read my profile that I had emailed him days prior and wasn't sure who I was. Suddenly I could feel the panic in the air. Something had gone terribly wrong and it was happening now. The Daugherty Report originally thought they were about to bring someone on their show who they assumed perhaps was "normal", someone who was going to reason within the boundaries of the same old American artificial Left-Right paradigm like all their previous guests. But now after reading my profile (for the first time?) and reading my history of standing for truth, my previous writings, my credentials, my military, psychology and medical background, my credibility, and my determination to warn everyone of the expanding globalist new world order plans, perhaps the reputation of The Daugherty Report was threatened? Perhaps The Daugherty Report would get some push back from supporters still stuck in the Left-Right paradigm? Might they lose supporters for having me on? Lose perceived credibility? I don't know the answer to these speculations, over a month has passed and the urgent invitation to be a guest on their show suddenly went away. I've never heard from them again and if I ever do I'll surely provide an update. I want to remind readers that this is a classic example of how many well intended Americans really are still stuck in the Left-Right propaganda scripted paradigm. Those entangled in this artificial, longstanding and deceptive paradigm have moments of reason. They are still able to connect some dots but they continue to try to solve the problems of the world by listening to the same old voices of ignorance and deceit. When these people are confronted with truth and logic they would rather brush it away, ignore or even silence these voices than to have to confront what could be an uncomfortable reality they live in. They ignore the history of propaganda in the U.S., the history of the central bankers who have funded both sides of every single war of the last several centuries. They ignore the history of the CIA and their control of the mainstream media. They have swallowed every government blue pill you could possibly swallow and have become drunken on government propaganda Kool Aid without thinking for a minute that they are being lied to. To understand the problems of today they turn to individual who are working inside the control system for answers. They listen to people with ties to the very Military Industrial Complex that President Dwight Eisenhower warned the world about. They ignore the important warnings of John F. Kennedy about secret societies and control of information to justify war and injustices. They ignore every important released government document that points to corruption, staged mass media propaganda, false flags, government lies, and all their new world order plans. Despite all of this, many well meaning truth seeking Americans still fight hard to truly understand what is happening and make sense of it all. Sadly they are entrapped in the repeating, self-perpetuating, ongoing, lying, artificial and staged Left-Right paradigm that makes them believe that if the Democrats have this one issue wrong then maybe we should listen to the Republicans or vice versa. In the end, this problem is not about one radio show, what I experienced is happening all over America. Programs that want to sound and appear as "normal" or non-conspiratorial are permanently enslaved to the control system's false paradigm. Until humanity is prepared to once and for all dump this CIA western new world order psyop paradigm known as the Left-Right paradigm and finally look to humanity, truth, objectivity, critical thinking, spirituality, intuition, and look to the god inside of you for answers, you will never truly be free and you will never truly figure it out. Those stuck in the modern day artificial, humanity-stifling, government concocted Left-Right paradigm will always be 'almost-awakened' never having really come to the full fruition of mental freedom and awakening that comes with waking up to the new world order plans. Unless they dump the CIA Left-Right globalist propaganda paradigm, these people will always spin in circles, always wondering who might be right and who might be wrong, all along while thinking that perhaps they've got it all figured out. Ultimately, it's about all of humanity coming together and taking a stand against the new world order's globalist elite and their politician puppets. It's about taking a stand for what is right. It's about condemning all wars and all pro-war military propaganda intended to have you support another war. It's not about supporting the United States' wars and then condemning other acts of war as if the U.S. act of war is justified or standing in morality. It's about recognizing that all wars are evil. As we've seen in our modern times it is government (U.S. and Allies/NATO etc) who fund terrorism. It is government who wage perpetual war, torture humans and illegally incarcerate them. It's government that enslave its citizens with false flag events to take away its rights and enslave them with debt while working hand in hand with private corporations to maximize profits at the little people's expense. Anyone defending war (which is all about profits) in the name of a flag or political party is without question part of the problem. My love and heart goes out to these people in America still trying to solve the problems of the world using the tools offered by the artificial Left-Right, flag-waving paradigm. I hope they figure it out soon enough to join us in the humanity movement that is waiting for them. Here's more on the humanity movement- We don't wave flags, political parties, symbols and political ideologies. Instead we speak truth, we love, we share our hearts, we reach out to those in need, we resist and call out evil, we listen to our own minds and hearts, we respect nature and all life on earth, and we know that there is no person on earth that has the right to control or kill you. We value freedom, liberty and justice and we are truly one. Are you part of the human race or are you still living in the Left-Right paradigm of lies?